Dangerous Quagga mussels have been found for the first time in the UK and experts say they could devastate British wetlands, block pipes and cause flooding. The mussels, native to Ukraine, were discovered in the Wraysbury Reservoir near Heathrow Airport last week. Wildfowl and Wetland Trust (WWT) says the mussels are less than 5cm long but breed prolifically, forming vast colonies on hard surfaces. Wraysbury Reservoir is a popular sailing, fishing and scuba diving lake which is also a protected area for wildlife. Wildlife experts are extremely concerned about the quagga mussels, which have been described as "ecosystem engineers" because their vast capacity to filter water upsets the natural balance throughout the food web. They eat some pollutants but turn them into concentrated toxic poo which can poison drinking water for people and wildlife. WWT's head of conservation policy, Jeff Knott said: "This is a worrying, but entirely predictable, development that could be devastating to British wetlands. Quagga mussels are likely to indirectly cause suffering and death for hundreds of thousands of native animals, fish and plants and cost millions of pounds in tax and water bills to protect drinking water supplies. "These tiny mussels can be devastating but look so innocuous, which is why it's so difficult for boaters, anglers and other water users to avoid accidentally transferring them between water bodies when they latch onto their equipment. That's why it's so important for all water users to remember the motto 'clean, check, dry' when they pack up their equipment to help slow the spread. "Quagga mussels are a prime example of why we need stronger controls on invasive species being brought into this country. Prevention is far cheaper and more effective than trying to control an infestation that's already established. 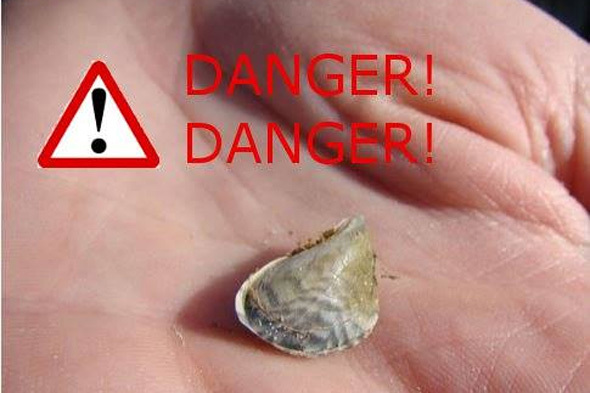 There are plenty of other dangerous potential invasive species. Quagga mussels may have arrived, but we need to protect the UK against the next invasive species."